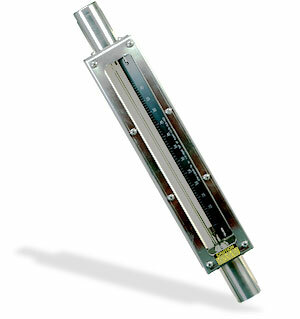 The Omega FL900 series are heavy duty flowmeter with stainless steel enclosures, unique float stop design allowing internals to be reomoved and replaced without disturbing the tube and the tube has a direct reading scale. The accuracy is ±2% of full scale, repeatability is ±1%, the scale is 250 mm or 10 inches, the wetted parts are as follows: 316 stainless steel, EPR o-rings, and borosilicate glass. 참고: *Minimum flowrate is 10% of Maximum shown. Model FL917P requires minimum 30 psi outlet pressure, to keep float from becoming unstable. Weights shown are for both water and air models. For a 10-point NIST calibration certificate add "-NIST10" to model number, add $350 to price.